You are cordially invited to share in the development of two new actions that are likely to be included in a forthcoming release of the PPW panel. These should be considered beta actions, but the Applied Color Theory list has already tested them and certain problems have been corrected. The reaction to these actions has been very positive, as they are quite powerful for certain image types. For the moment they must be loaded into and played out of the Actions palette. The two actions are tentatively called Lesser Hammer and Velvet Hammer. As the names suggest, they have some similarities to the Bigger Hammer action that already is found in the PPW panel. Each one has its own uses; the Bigger Hammer is not being replaced. The package you can download here contains the two actions, plus a lengthy PDF documentation of the Lesser Hammer, plus a text file suggesting when each should be used, as opposed to the alternatives of the Bigger Hammer or applying a false profile and then multiplying. The reason for this confusing structure is that initially I thought Lesser Hammer would be the only new action. I did not plan for it to be effective on fleshtone images, but it turned out to be so, sometimes. This occasional success was so tantalizing that I fell into the claws of temptation and developed the Velvet Hammer to deal with the specific problem. Here’s a quick look at what they can do, and why users so far have found them so interesting. 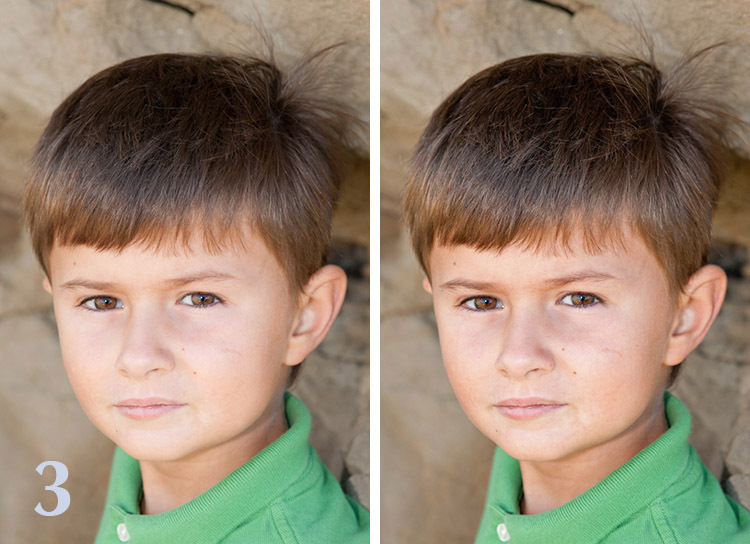 In all cases, I’m just showing before-and-after of the default setting for the action. The Bigger Hammer is a violent action. It was designed for images like waterfalls, where we need absolutely every bit of highlight detail possible. Originally, that was the only kind of image I used it for. As time went on, I found that it was applicable to many other kinds of images. Usually, however, I had to use a low opacity, because the violence of the action would leave traces otherwise. So the gain, while there, was small. The Lesser Hammer subtly deepens lighter areas. Left, before the action is played. Right, the Lesser Hammer defaults. 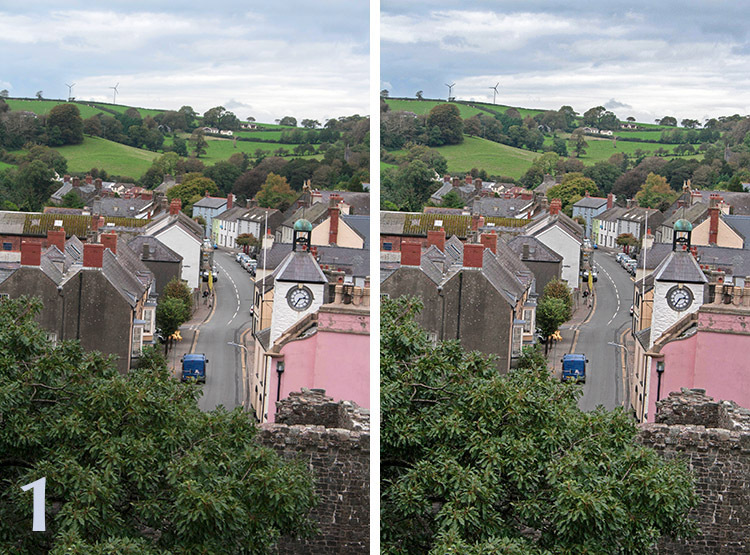 The Welsh village scene of Figure 1 does not depend on highlight detail. If if did, for example if it were entirely a picture of the white clock tower in the foreground, I would still use the Bigger Hammer. Here, however, I would just like an overall deeper feeling in the lighter half of the picture. The Lesser Hammer does this. The houses, street, and sky are darker and more detailed. There is also a soft addition of detail in the shadows. Flowers are a specialty of the Lesser Hammer. Left, before the action. Right, the Lesser Hammer default result. The Lesser Hammer does well with strongly colored objects, such as darker flowers. But even with something as delicate as the flowers of Figure 2, it adds detail without going overboard with color. In fact, the user can tone down the color even more within the action, to leave room for something like the MMM action later on. My first experiments with fleshtones using the Lesser Hammer were impressive. Just when I decided that I had revolutionized fashion retouching. reality set in, in the form of some faces that the action damaged. It could be controlled with a lot of work, but the potential improvement was so tantalizing that I finally gave up and came up with a modified action, the Velvet Hammer, which doesn’t have the shortcomings. It’s a safe way to attack light and dark areas in almost any image. It doesn’t replace the more violent Lesser Hammer in something like the village of Figure 1, any more than the Lesser Hammer replaces the more violent Bigger Hammer in an image where highlight detail is the absolute priority. The Velvet Hammer action adds shape to fleshtones and softens hair. Both variables can be adjusted independently. Left, before the action is played. Right, the default Velvet Hammer result. Figure 3 shows what the Velvet Hammer does by default. The face is better shaped and more realistic. The hair is softened and highlighted. These two things are controllable individually; you can have one without the other. 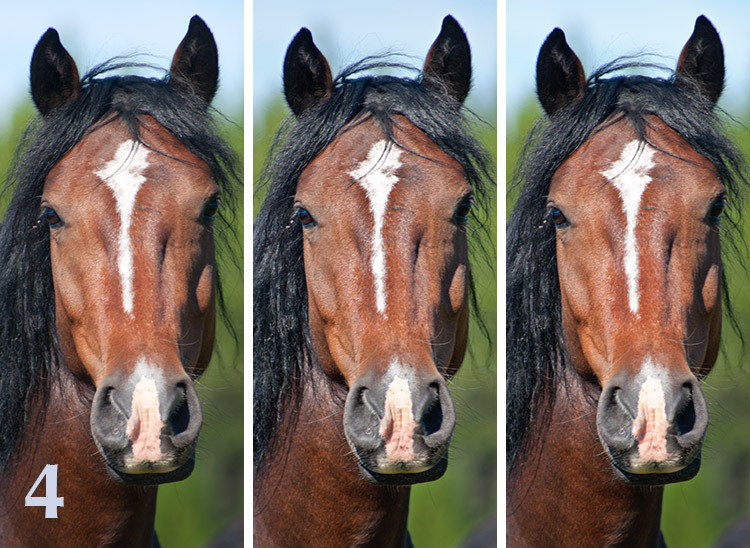 We now have three different hammers in the toolbox, not to mention the possibility of applying a false profile and multiplying through a blurred layer mask (which is another variation on the same idea), plus Photoshop’s Shadows/Highlights command, and the Highlights and Shadows commands within Camera Raw. It is certainly tough to keep straight which action works best on what. As noted earlier, a text file in the download offers from answers. But it’s probably just as easy to try two or more options. Figure 4 shows an original, plus defaults of the Lesser Hammer and the Velvet Hammer. Either one beats the original, but which is the better of the two? It depends on your point of view. Lesser Hammer has better contrast, Velvet Hammer a certain smoothness. You can choose one or the other, or split the difference between the two, or, if you don’t feel that the effect is strong enough, play one action and then the other. If you decide to check these out, please let us know how well they work for you, so that we can make whatever changes are necessary if we decide to include them in subsequent versions of the PPW panel. Each action has its strengths. They can be blended, or played on top of one another. Left, before the action is played. Center, the default result of the Lesser Hammer. Right, starting from the left-hand version, the default result of the Velvet Hammer. Great additions to the armoury. I’m in the process of working my way through 1000 or so photos taken in the Canadian Rockies & Iceland last year. While the Bigger Hammer does wonders for many of my shots of glaciers, icebergs & snow, there are some images where “less is more”. 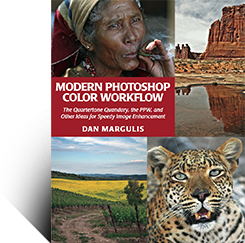 I’d also like to say that having finished my first go-through of the book I’m knocked out by how much my images are being improved using the PPW. But most of all, the sharpening action set alone is worth the price of the book. 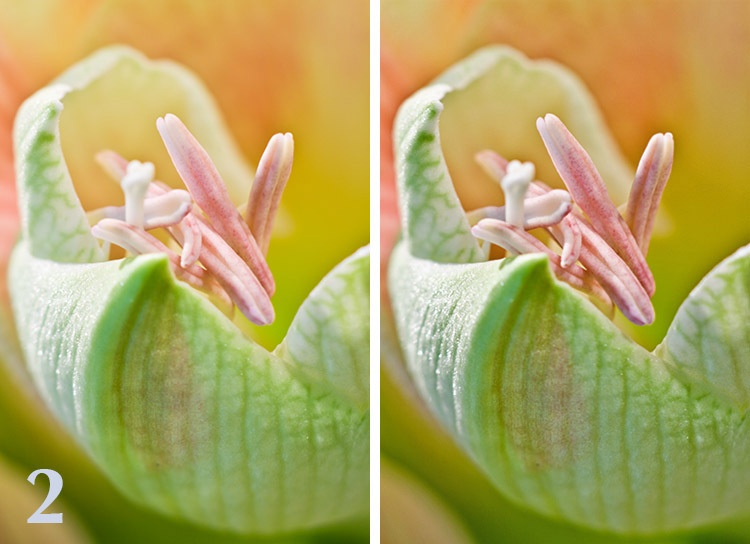 Sharpening is something I’ve struggled with over the years but this is amazing – NO HALOES! Plus I even understand the theory behind the moves. Many thanks indeed. Glad you’re finding them useful. For those having trouble differentiating the uses of the three hammers (especially the Bigger one), the phrase above, “glaciers, icebergs & snow” is key. If one of those things is the subject, then you absolutely need to maximize highlight detail and the image can be counted as a failure if you don’t. That’s when the Bigger Hammer is needed. By contrast, the images shown in the post are subtler: additional highlight detail is welcome but not indispensable. That suggests one of the other two. I am interested in purchasing your new book but it appears to be out of stock at Amazon. Do you have any idea whether there will be a new print run? I’d love to get a copy! The book is not out of stock, it just displays differently than books from conventional publishers. Currently it shows that “3 new” copies are available, just as if you would have to go to a third-party vendor to buy them. In fact, though, it’s Amazon itself that stocks the books and ships them. So, just click on the “3 new”, and you’re all set. There are plenty of copies to last through this year at least. Thanks Dan! However, the 3 “new” books are priced at $74.95, $115.99 and $243.66 respectively. I really want the book, but would hate to pay a multiple of the actual price! Let me know if you have a way for me to get it at the regular price. The regular price is $74.95, from amazon. Well that solves the mystery! There was no indication on Amazon of the true retail price that I could find.